This class is responsible for defining the semantics of the RISC-like operations invoked by the translation object (e.g., X86InstructionSemantics). We omit the definitions for most of the RISC operations from the base class so that failure to implement them in a subclass is an error. RISC operator arguments are, in general, SValue pointers. However, if the width of a RISC operator's result depends on an argument's value (as opposed to depending on the argument width), then that argument must be a concrete value (i.e., an integral type). This requirement is due to the fact that SMT solvers need to know the sizes of their bit vectors. Operators extract, unsignedExtend, signExtend, readRegister, and readMemory fall into this category. Operators with side effects (writeRegister, writeMemory, and possibly others) usually modify a State object pointed to by the currentState property. Keeping side effects in states allows RiscOperators to be used in data-flow analysis where meeting control flow edges cause states to be merged. Side effects that don't need to be part of a data-flow can be stored elsewhere, such as data members of a subclass or the initialState property. RiscOperator objects are allocated on the heap and reference counted. The BaseSemantics::RiscOperator is an abstract class that defines the interface. 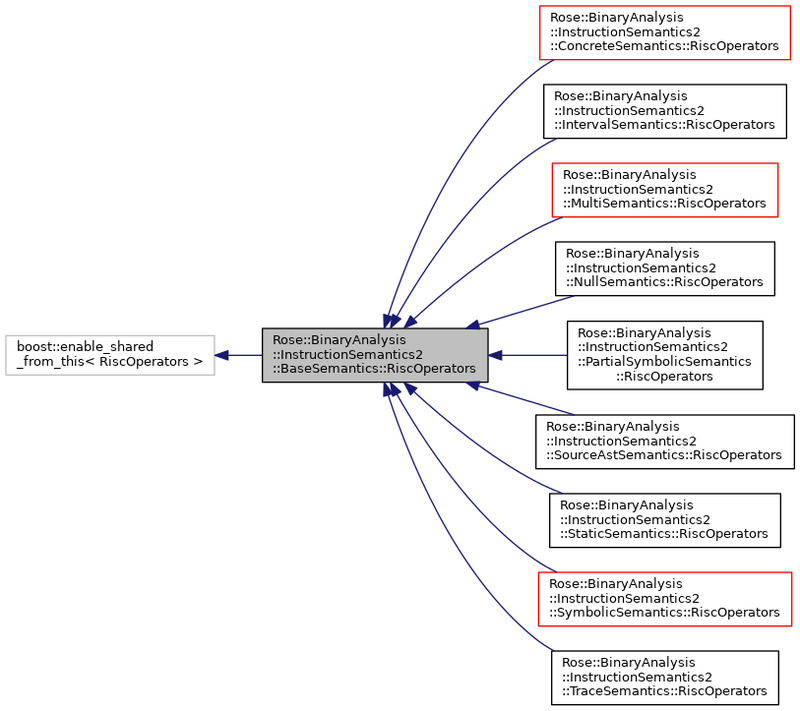 See the Rose::BinaryAnalysis::InstructionSemantics2 namespace for an overview of how the parts fit together. Definition at line 1379 of file BaseSemantics2.h. 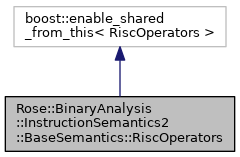 Shared-ownership pointer for a RiscOperators object. Definition at line 1426 of file BaseSemantics2.h. Implemented in Rose::BinaryAnalysis::InstructionSemantics2::SymbolicSemantics::RiscOperators, Rose::BinaryAnalysis::InstructionSemantics2::ConcreteSemantics::RiscOperators, Rose::BinaryAnalysis::InstructionSemantics2::IntervalSemantics::RiscOperators, Rose::BinaryAnalysis::InstructionSemantics2::PartialSymbolicSemantics::RiscOperators, Rose::BinaryAnalysis::InstructionSemantics2::NullSemantics::RiscOperators, Rose::BinaryAnalysis::InstructionSemantics2::SourceAstSemantics::RiscOperators, Rose::BinaryAnalysis::Partitioner2::Semantics::RiscOperators, Rose::BinaryAnalysis::InstructionSemantics2::MultiSemantics::RiscOperators, Rose::BinaryAnalysis::InstructionSemantics2::StaticSemantics::RiscOperators, Rose::BinaryAnalysis::InstructionSemantics2::TraceSemantics::RiscOperators, and Rose::BinaryAnalysis::InstructionSemantics2::LlvmSemantics::RiscOperators. The protoval is used to construct other values via its virtual constructors. Definition at line 1463 of file BaseSemantics2.h. Referenced by Rose::BinaryAnalysis::InstructionSemantics2::SourceAstSemantics::RiscOperators::instance(), Rose::BinaryAnalysis::InstructionSemantics2::MultiSemantics::RiscOperators::svalue_empty(), Rose::BinaryAnalysis::InstructionSemantics2::IntervalSemantics::RiscOperators::svalue_from_bits(), and Rose::BinaryAnalysis::InstructionSemantics2::IntervalSemantics::RiscOperators::svalue_from_intervals(). This property holds a pointer to the satisfiability modulo theory (SMT) solver to use for certain operations. An SMT solver is optional and not all semantic domains will make use of a solver. Domains that use a solver will fall back to naive implementations when a solver is not available (for instance, equality of two values might be checked by looking at whether the values are identical). Definition at line 1473 of file BaseSemantics2.h. Referenced by Rose::BinaryAnalysis::InstructionSemantics2::LlvmSemantics::RiscOperators::create(), Rose::BinaryAnalysis::InstructionSemantics2::MultiSemantics::RiscOperators::create(), Rose::BinaryAnalysis::InstructionSemantics2::NullSemantics::RiscOperators::create(), Rose::BinaryAnalysis::InstructionSemantics2::PartialSymbolicSemantics::RiscOperators::create(), Rose::BinaryAnalysis::InstructionSemantics2::IntervalSemantics::RiscOperators::create(), Rose::BinaryAnalysis::InstructionSemantics2::SymbolicSemantics::RiscOperators::create(), Rose::BinaryAnalysis::InstructionSemantics2::LlvmSemantics::RiscOperators::instance(), Rose::BinaryAnalysis::InstructionSemantics2::NullSemantics::RiscOperators::instance(), Rose::BinaryAnalysis::InstructionSemantics2::PartialSymbolicSemantics::RiscOperators::instance(), Rose::BinaryAnalysis::InstructionSemantics2::IntervalSemantics::RiscOperators::instance(), and Rose::BinaryAnalysis::InstructionSemantics2::SymbolicSemantics::RiscOperators::instance(). Definition at line 1474 of file BaseSemantics2.h. This is the state upon which the RISC operations operate. The state need not be set until the first instruction is executed (and even then, some RISC operations don't need any machine state; typically, only register and memory read and write operators need state). Different state objects can be swapped in at pretty much any time. Modifying the state has no effect on this object's prototypical value which was initialized by the constructor; new states should have a prototyipcal value of the same dynamic type. Definition at line 1488 of file BaseSemantics2.h. Definition at line 1489 of file BaseSemantics2.h. Property: Optional lazily updated initial state. If non-null, then any calls to readMemory or readRegister which do not find that the address or register has a value, not only instantiate the value in the current state, but also write the same value to this initial state. In effect, this is like Schrodinger's cat: every memory address and register has a value, we just don't know what it is until we try to read it. Once we read it, it becomes instantiated in the current state and the initial state. The default initial state is the null pointer. Changing the current state does not affect the initial state. This makes it easier to use a state as part of a data-flow analysis, in which one typically swaps in different current states as the data-flow progresses. The initial state need not be the same type as the current state, as long as they both have the same prototypical value type. For instance, a symbolic domain could use a MemoryCellList for its currentState and a state based on a MemoryMap of concrete values for its initial state, as long as those concrete values are converted to symbolic values when they're read. Caveats: Not all semantic domains use the initial state. The order that values are added to an initial state depends on the order they're encountered during the analysis. This example, shows one way to use an initial state and the effect is has on memory and register I/O. It uses the same type for the initial state as it does for the current states. This example is somwewhat more advanced. It uses a custom state, which is a relatively common practice of users, and augments it to do something special when it's used as an initial state. When it's used as an initial state, it sets a flag for the values produced so that an analysis can presumably detect that the value is an initial value. Definition at line 1529 of file BaseSemantics2.h. Definition at line 1530 of file BaseSemantics2.h. This property is the name of the semantic domain and is used in diagnostic messages. Definition at line 1538 of file BaseSemantics2.h. Definition at line 1539 of file BaseSemantics2.h. Used for printing RISC operators with formatting. Definition at line 1570 of file BaseSemantics2.h. Definition at line 1571 of file BaseSemantics2.h. Property: Number of instructions processed. This counter is incremented at the beginning of each instruction. Definition at line 1579 of file BaseSemantics2.h. Definition at line 1580 of file BaseSemantics2.h. Returns the instruction which is being processed. This is set by startInstruction and cleared by finishInstruction. Returns null if we are not processing an instruction. Definition at line 1587 of file BaseSemantics2.h. Referenced by Rose::BinaryAnalysis::InstructionSemantics2::SymbolicSemantics::RiscOperators::boolean_(), and Rose::BinaryAnalysis::InstructionSemantics2::SymbolicSemantics::RiscOperators::number_(). Reimplemented in Rose::BinaryAnalysis::InstructionSemantics2::MultiSemantics::RiscOperators, Rose::BinaryAnalysis::InstructionSemantics2::StaticSemantics::RiscOperators, Rose::BinaryAnalysis::Partitioner2::Semantics::RiscOperators, and Rose::BinaryAnalysis::InstructionSemantics2::TraceSemantics::RiscOperators. Reimplemented in Rose::BinaryAnalysis::InstructionSemantics2::MultiSemantics::RiscOperators, and Rose::BinaryAnalysis::InstructionSemantics2::TraceSemantics::RiscOperators. Definition at line 1597 of file BaseSemantics2.h. Definition at line 1611 of file BaseSemantics2.h. Referenced by peekRegister(), readRegister(), and Rose::BinaryAnalysis::InstructionSemantics2::BaseSemantics::MemoryCellList::scan(). Reimplemented in Rose::BinaryAnalysis::InstructionSemantics2::SymbolicSemantics::RiscOperators, Rose::BinaryAnalysis::InstructionSemantics2::MultiSemantics::RiscOperators, and Rose::BinaryAnalysis::InstructionSemantics2::TraceSemantics::RiscOperators. Definition at line 1619 of file BaseSemantics2.h. Definition at line 1624 of file BaseSemantics2.h. Definition at line 1629 of file BaseSemantics2.h. Reimplemented in Rose::BinaryAnalysis::InstructionSemantics2::MultiSemantics::RiscOperators, Rose::BinaryAnalysis::InstructionSemantics2::StaticSemantics::RiscOperators, and Rose::BinaryAnalysis::InstructionSemantics2::TraceSemantics::RiscOperators. Definition at line 1640 of file BaseSemantics2.h. Definition at line 1647 of file BaseSemantics2.h. Definition at line 1654 of file BaseSemantics2.h. Invoked for the x86 HLT instruction. Reimplemented in Rose::BinaryAnalysis::InstructionSemantics2::SourceAstSemantics::RiscOperators, Rose::BinaryAnalysis::InstructionSemantics2::StaticSemantics::RiscOperators, and Rose::BinaryAnalysis::InstructionSemantics2::TraceSemantics::RiscOperators. Definition at line 1659 of file BaseSemantics2.h. Invoked for the x86 CPUID instruction. FIXME: x86-specific stuff should be in the dispatcher. Definition at line 1662 of file BaseSemantics2.h. Invoked for the x86 RDTSC instruction. Definition at line 1665 of file BaseSemantics2.h. Implemented in Rose::BinaryAnalysis::InstructionSemantics2::SymbolicSemantics::RiscOperators, Rose::BinaryAnalysis::InstructionSemantics2::MultiSemantics::RiscOperators, Rose::BinaryAnalysis::InstructionSemantics2::ConcreteSemantics::RiscOperators, Rose::BinaryAnalysis::InstructionSemantics2::IntervalSemantics::RiscOperators, Rose::BinaryAnalysis::InstructionSemantics2::SourceAstSemantics::RiscOperators, Rose::BinaryAnalysis::InstructionSemantics2::PartialSymbolicSemantics::RiscOperators, Rose::BinaryAnalysis::InstructionSemantics2::StaticSemantics::RiscOperators, Rose::BinaryAnalysis::InstructionSemantics2::NullSemantics::RiscOperators, and Rose::BinaryAnalysis::InstructionSemantics2::TraceSemantics::RiscOperators. Returns a Boolean to indicate whether the relationship between a and b holds. Both operands must be the same width. It doesn't matter if they are interpreted as signed or unsigned quantities. Returns a Boolean to indicate whether the relationship between a and b is true when a and b are interpreted as unsigned values. Both values must have the same width. This operation is a convenience wrapper around other RISC operators. Returns a Boolean to indicate whether the relationship between a and b is true when a and b are interpreted as signed values. Both values must have the same width. This operation is a convenience wrapper around other RISC operators. Reimplemented in Rose::BinaryAnalysis::InstructionSemantics2::SymbolicSemantics::RiscOperators, Rose::BinaryAnalysis::InstructionSemantics2::ConcreteSemantics::RiscOperators, Rose::BinaryAnalysis::InstructionSemantics2::MultiSemantics::RiscOperators, Rose::BinaryAnalysis::InstructionSemantics2::IntervalSemantics::RiscOperators, Rose::BinaryAnalysis::InstructionSemantics2::SourceAstSemantics::RiscOperators, Rose::BinaryAnalysis::InstructionSemantics2::StaticSemantics::RiscOperators, and Rose::BinaryAnalysis::InstructionSemantics2::TraceSemantics::RiscOperators. Definition at line 1787 of file BaseSemantics2.h. Implemented in Rose::BinaryAnalysis::InstructionSemantics2::SymbolicSemantics::RiscOperators, Rose::BinaryAnalysis::InstructionSemantics2::ConcreteSemantics::RiscOperators, Rose::BinaryAnalysis::InstructionSemantics2::MultiSemantics::RiscOperators, Rose::BinaryAnalysis::InstructionSemantics2::IntervalSemantics::RiscOperators, Rose::BinaryAnalysis::InstructionSemantics2::SourceAstSemantics::RiscOperators, Rose::BinaryAnalysis::InstructionSemantics2::PartialSymbolicSemantics::RiscOperators, Rose::BinaryAnalysis::InstructionSemantics2::StaticSemantics::RiscOperators, Rose::BinaryAnalysis::InstructionSemantics2::NullSemantics::RiscOperators, and Rose::BinaryAnalysis::InstructionSemantics2::TraceSemantics::RiscOperators. Subtract one value from another. This is not a virtual function because it can be implemented in terms of add and negate. We define it because it's something that occurs often enough to warrant its own function. Reimplemented in Rose::BinaryAnalysis::InstructionSemantics2::SymbolicSemantics::RiscOperators, Rose::BinaryAnalysis::InstructionSemantics2::SourceAstSemantics::RiscOperators, Rose::BinaryAnalysis::InstructionSemantics2::StaticSemantics::RiscOperators, Rose::BinaryAnalysis::InstructionSemantics2::ConcreteSemantics::RiscOperators, Rose::BinaryAnalysis::InstructionSemantics2::PartialSymbolicSemantics::RiscOperators, and Rose::BinaryAnalysis::InstructionSemantics2::TraceSemantics::RiscOperators. Definition at line 1852 of file BaseSemantics2.h. Reimplemented in Rose::BinaryAnalysis::InstructionSemantics2::ConcreteSemantics::RiscOperators, Rose::BinaryAnalysis::InstructionSemantics2::MultiSemantics::RiscOperators, and Rose::BinaryAnalysis::InstructionSemantics2::TraceSemantics::RiscOperators. Reimplemented in Rose::BinaryAnalysis::InstructionSemantics2::MultiSemantics::RiscOperators, Rose::BinaryAnalysis::InstructionSemantics2::ConcreteSemantics::RiscOperators, and Rose::BinaryAnalysis::InstructionSemantics2::TraceSemantics::RiscOperators. Definition at line 1964 of file BaseSemantics2.h. Reimplemented in Rose::BinaryAnalysis::InstructionSemantics2::SymbolicSemantics::RiscOperators, Rose::BinaryAnalysis::InstructionSemantics2::MultiSemantics::RiscOperators, Rose::BinaryAnalysis::InstructionSemantics2::SourceAstSemantics::RiscOperators, Rose::BinaryAnalysis::InstructionSemantics2::StaticSemantics::RiscOperators, Rose::BinaryAnalysis::InstructionSemantics2::TraceSemantics::RiscOperators, and Rose::BinaryAnalysis::InstructionSemantics2::DataFlowSemantics::RiscOperators. Definition at line 1979 of file BaseSemantics2.h. Definition at line 1992 of file BaseSemantics2.h. Implemented in Rose::BinaryAnalysis::InstructionSemantics2::SymbolicSemantics::RiscOperators, Rose::BinaryAnalysis::InstructionSemantics2::MultiSemantics::RiscOperators, Rose::BinaryAnalysis::InstructionSemantics2::ConcreteSemantics::RiscOperators, Rose::BinaryAnalysis::InstructionSemantics2::IntervalSemantics::RiscOperators, Rose::BinaryAnalysis::InstructionSemantics2::SourceAstSemantics::RiscOperators, Rose::BinaryAnalysis::InstructionSemantics2::StaticSemantics::RiscOperators, Rose::BinaryAnalysis::InstructionSemantics2::PartialSymbolicSemantics::RiscOperators, Rose::BinaryAnalysis::InstructionSemantics2::NullSemantics::RiscOperators, Rose::BinaryAnalysis::InstructionSemantics2::TraceSemantics::RiscOperators, Rose::BinaryAnalysis::InstructionSemantics2::DataFlowSemantics::RiscOperators, and Rose::BinaryAnalysis::InstructionSemantics2::LlvmSemantics::RiscOperators. Implemented in Rose::BinaryAnalysis::InstructionSemantics2::SymbolicSemantics::RiscOperators, Rose::BinaryAnalysis::InstructionSemantics2::MultiSemantics::RiscOperators, Rose::BinaryAnalysis::InstructionSemantics2::ConcreteSemantics::RiscOperators, Rose::BinaryAnalysis::InstructionSemantics2::IntervalSemantics::RiscOperators, Rose::BinaryAnalysis::InstructionSemantics2::SourceAstSemantics::RiscOperators, Rose::BinaryAnalysis::InstructionSemantics2::StaticSemantics::RiscOperators, Rose::BinaryAnalysis::InstructionSemantics2::PartialSymbolicSemantics::RiscOperators, Rose::BinaryAnalysis::InstructionSemantics2::NullSemantics::RiscOperators, Rose::BinaryAnalysis::InstructionSemantics2::TraceSemantics::RiscOperators, and Rose::BinaryAnalysis::InstructionSemantics2::DataFlowSemantics::RiscOperators.